“Now here’s a funky introduction of how nice I am. Tell your mother, tell your father, send a telegram. I’m like an energizer cause, you see, I last long. 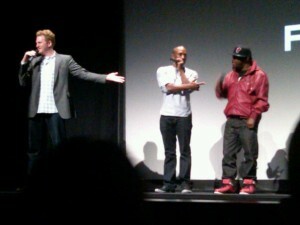 Five years ago I attended a screening of Michael Rapaport’s documentary “Beats, Rhymes & Life: The Travels of A Tribe Called Quest”. Tribe had been one of my absolute favorite Hip Hop bands (still is). I went to a TCQ show shortly after college when I moved to New York City. Busta Rhymes made a guest appearance and I remember fondly how everyone went bananas-cuckoo-crazy when he jumped on stage. It was at THAT very show where A Tribe Called Quest announced that they were breaking-up. It was shocking. Years later I learned Michael Rapaport (actor/director) was at the very same NYC show in 1998. He was so fascinated by the break-up and was a super fan, that he decided to make a documentary or “rapumentary” about the group’s rise to fame and subsequent feuding and break-up. I made it my mission to go to the opening screening of the movie at the Tribeca Film Festival. I knew Phife Dawg (member of TCQ) was diabetic, person-with-diabetes, and had undergone a kidney transplant. i was quite curious to see how he was doing. What I didn’t know, and was surprised to find while viewing the movie, was the significant role diabetes played in the break-up and conflicts within the band. Diagnosed in 1990, Phife made it clear in both the movie and in the Q&A with the audience, that he struggled with his diabetes diagnosis. Phife had problems with hypoglycemia and hyperglycemia as the fame of the band grew. He also addressed how fluctuations in glucose levels led to moodiness which also led to conflicts with his bandmates. I sat in the theater next to my college roommate, as Phife spoke, we both cried. 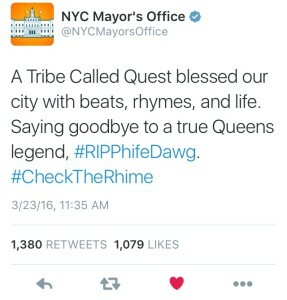 This morning, I read that Phife passed away. I just saw a release from his family that he passed from complications of diabetes. One of my brothers contacted me about whether Phife was T1D or T2D. Over the years, I have seen reports of both. All I know, is when I hear of a loss of life from diabetes, I am flooded with feelings and then ideas. Today, I think of my many happy memories listening to and seeing a Tribe Called Quest while in college, when I was a brand new New Yorker, and at a film screening. I think of the massive influence TCQ had on so many of today’s musicians. I think of all the times I giggled listening to the incredibly creative lyrics of Tribe songs. This entry was posted in Diabetes Notes and tagged complications, diabetes, diabetesisajerk, duckfiabetes, malik taylor, phife, phifedawg, Tribe, Tribe called Quest, TribecalledQuest by surfacefine. Bookmark the permalink.